Hey again, everybody! This week, I decided to venture further out of my comfort zone and visit a fairly new coffee shop to the local scene that I tend to not frequent as often as I do Saint’s Cafe. I took a trip to Rothrock Coffee, a unique coffeehouse experience that has only been around since early 2016; I can remember being incredibly excited to try this new place whenever its plan to open was first announced! But I digress – Rothrock Coffee is abundant in delicious drinks, food, and a calming atmosphere that is sure to be enjoyed by anyone who steps foot into the cafe. Rothrock Coffee takes the name of our local greenery that resides in our own backyard, Rothrock State Forest. The inspiration drawn from the various activities completed in this area that the owners are so passionate about is actually defined on their website, rothrockcoffee.com. Being able to rely on such a giving and community-centered space such as Rothrock State Forest and allowing that to translate into a modern-day coffee experience that does its part to bring the community together is incredible; various events are held every now and then at Rothrock Coffee, allowing the locals to come together and enjoy company over a fresh cup of coffee. The cool history of the name of the shop, as well as the sense of togetherness that is cultivated from various community-based events is enough to make any coffee shop receive a five-star review. However, there’s even more goodness to add! During my visit to Rothrock, I had a regular latte and an order of their famous avocado toast. I sure did feel like a millennial that day. The basic latte, a precious staple in my coffee diet, must be crafted with careful precision in order to be wonderfully enjoyed, and Rothrock does just that. The espresso roast that is used has notes of sweetness while lacking in a lot of the bitterness and acidity that many espresso based drinks contain. And if the aesthetic is what makes or breaks your coffee experience, don’t worry: the latte art is so incredible that you’ll be sure to Instagram a picture before the first sip even touches your lips. I am always skeptical about trying “real” food from cafes that only seem to specialize in drinks. However, as I read good reviews on Yelp about Rothrock’s avocado toast, I decided to take a leap of faith, and the avocado toast did not disappoint. The bread that is used is one of the most delicious breads I have ever eaten, and it’s heated on a panini press before being slathered with copious amounts of arugula, avocado, chia seeds, and oil drizzle on top. Finally, the atmosphere, as I mentioned in my review of Saint’s, is one of the most important aspects that can make a trip to a local coffee shop either enjoyable or miserable. Rothrock roasts its own beans in store, which is a thrilling characteristic of this shop that sets it apart from many other coffee sellers in the area, adding to the authenticity of the experience. Additionally, Rothrock’s style is recognized by its modern wooden tables and chairs, red high-top stools, and revamped industrial lighting fixtures, with plenty of seating room, all being sure to add a minimalistic twist to this modern coffeehouse. Rothrock Coffee is located at 1736 S. Atherton St., just outside of downtown State College and Penn State’s campus. Rothrock Coffee’s hours are Monday through Saturday from 7 am – 6pm and Sunday from 8 am – 3 pm. Follow their Instagram page @RothrockCoffee and like their Facebook page. The way you started the post makes it engaging and interesting. It grabs my attention and makes me wanted to read more. I liked how you included the history and a little background knowledge about the coffee shop. It gives an insight look for the audience to learn about the unique qualities of different coffee shops. Since this review comes from your personal experiences, it adds more credibility to the shop, and I can’t wait to try it. 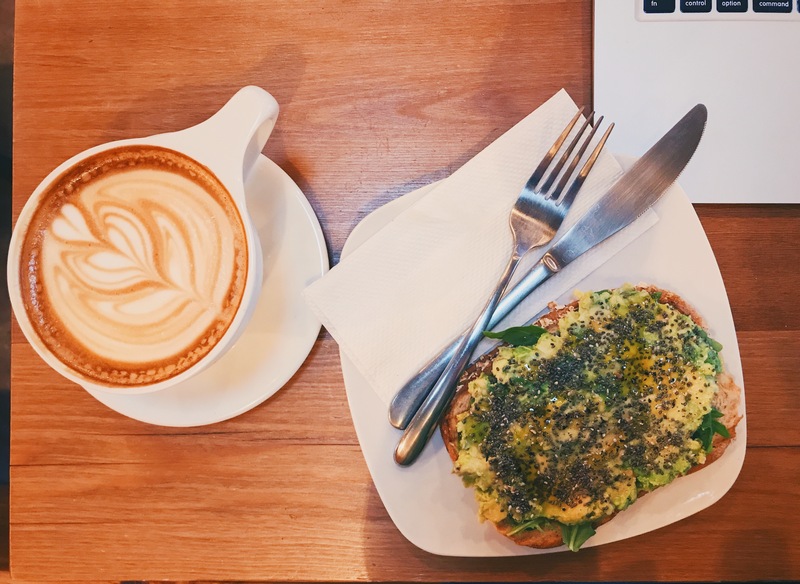 Instead of focusing entirely on their coffee, I like how you introduce the avocado toast in addition to gives more aspects of this coffee shop. However, I am a little upset that there is only one picture of the coffee shop. I wish you could add more pictures about the environment of the coffee shop like you explained in your post. Overall, it is a really great post about your passion and introduces to the audience shops hidden in State College. I am looking forward to more of the coffee shops and different flavors of coffee you will introduce in your blog.